The Fisticuffs slot machine transports you back to the Victorian era where you will take a seat in a dark room for an underground boxing match to watch two brawlers (a skinny moustached boxer versus a chubby out of shape boxer) enter the ring for a bloodthirsty encounter that only ends when one of them is left standing victoriously – and if the boxer you cheer on wins you could be fist bumping to the tune of 100,000 coins! All of the adrenaline pumping action takes place across 5x3 reels with 10 fixed paylines and a generous return to player percentage of 96.70%. You can gain entry to the ferocious spectacle from as little as 20p for a standing view at the back up to £200 for a front row seat in the heart of the action. Combine all of this with Stacked Wilds, Diagonal Wilds, Straight Wilds and the Boxing feature where the boxers go hell for leather and it’s easy to see why Fisticuffs has proven to be a knockout slot machine! Unusually there are two Wild symbols which are represented by each of the boxers, but more on their skills later, plus a Stacked Wild which appears in the Boxing feature, but there is much more to see inside the ropes of this vintage boxing ring. There is a big shiny championship belt which the sluggers battle it out for with five of these on a line worth 500 coins, a heavy gold cup which pays 250 for five on a line, a pair of red leather boxing gloves to prevent hand injuries with five of these worth 150 coins, a loud bell that dings to signal the start and end of each round, a stool to catch your breath after each round, a boxing boot for ample footwork around the ring, plus there is a spit bucket and towel which are the lowest valued items inside the ropes. As already alluded to, there are two Wild symbols in the Fisticuffs slot machine. These are the two boxers (the Skinny Moustached Boxer and the Chubby Boxer) who go toe to toe in the ring trading punch for punch in the hope of knocking each other out and them going Wild is always to your benefit. The Skinny Boxer is the Diagonal Wild and he only makes an appearance on the second and fourth reels while the Chubby Boxer is the Straight Wild and appears only on the third reel. While these boxers may not know to make use of the whole ring and prefer an up close and personal battle in the centre, both Wild symbols have typical Wild rules with the ability to substitute for all other symbols. Jab and uppercut skills are on show as the two Wild boxers go hell for leather in the Boxing feature which you can trigger in two different ways, and just like the EggOMatic slot machine which has also been released by Net Entertainment, the feature occurs during gameplay rather than you being transported to a new screen. The first method to triggering the Boxing feature is to land the Skinny Boxer next to the Chubby Boxer which will see the Skinny Boxer get walloped to either the first or fifth reel with all of the symbols in between turning Wild before one free spin plays out, with Stacked Wild symbols appearing only on the first and fifth reels during the feature. The other method is quite similar as whenever the Skinny Boxer appears in a diagonal position to the Chubby Boxer, the Skinny Boxer will smack the Chubby one on the reels with the symbol directly above or else below the Skinny Boxer transforming into a Wild symbol before the reels are spun once for free. No matter which method triggers the feature you will rarely be left disappointed by the wins from the Boxing feature and it’s funny to watch the vintage boxers exchange blows, however it is still quite disappointing that it’s only a single spin that you receive. Does Fisticuffs Pack a Punch? 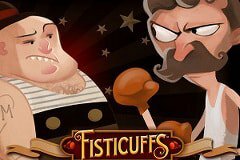 The Fisticuffs slot machine looks great but it certainly lacks the knockout punch you would have expected and you can’t help thinking that it needed more bonus features included. If you’re a big boxing fan and want a slot that packs a punch check out the Rocky slot machine from Playtech instead as it boasts a variety of bonus features for big winning combos!